Popularized in many of the highly acclaimed PBS documentaries produced by filmmaker Ken Burns, the technique of turning historic still images into something more palatable for a television audience (by slowly panning across the images, and fading in to new ones) has become a common technique for videographers with limited shooting budgets. PhotoFilmStrip (free) provides a one-stop application you can use to generate just such a video montage out of a series of still photographs. Find your inner Ken Burns with PhotoFilmStrip and your photos. The application can generate even HD quality video from something as simple as a few mouse clicks and some multi-megapixel digital images. All you do to generate your video is choose the images, the order in which you want them to appear, and the "motion path" you want the "camera" to follow as it pans and either cuts or fades between the pictures. 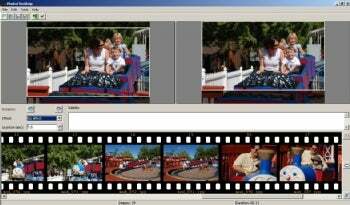 Click render and the software does the rest, churning out surprisingly high quality video files. The only downside is that there's no way to preview your film before you render it. But at this price, you can't really complain.